I completed my 12 EDT driving lessons with Pat from Top Class Driving School. He broke down every aspect of what is required of you in order to pass your driving test and drive safely in general. 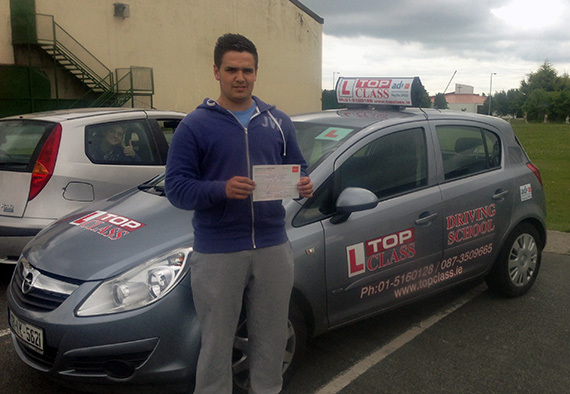 Pat made each lesson interesting and I felt after each lesson I had learned something new and my driving had improved. I did a couple of pre-tests and Pat had me completely ready to attempt the test. I passed the test first time in Finglas and I would recommend Pat to anyone that wants to learn to drive. He made me feel totally relaxed from our first meeting and he lets you know mistakes are part of learning. I would just like say that "I didn't have much confidence or driving experience and my test was coming up in two months". I used to make excuses why I couldn't drive but Pat gave me the confidence and I realised I could drive well and pass my test.